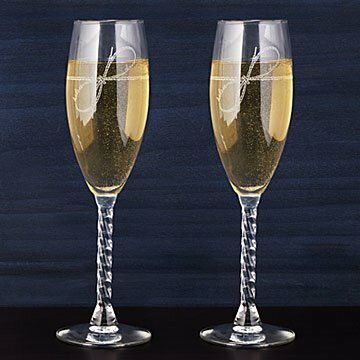 Toast the day you tied the knot with this creative keepsake set, which adds a twist to the classic champagne flute. Etched on each glass are your names incorporated into an elegant knot design, and a rope-inspired stem ties the look together. Every time you sip, you'll see your special date, too. Give them to newlyweds or for a special anniversary— it's a clever way to celebrate two lives intertwined. Glassware made in the US. Decorated in Reno, Nevada. Click here to see our Tie the Knot Glassware Duo. Design is beautiful. Great keepsake. Over priced for glass quality.